Brandon Marshall loves the spotlight of MNF. You get the feeling that tonight&apos;s Lions/Bears meeting at Soldier Field could be a throwback to the good ol&apos; days of the "Black and Blue" division games played decades ago. All week long the phrase "playing through the whistle-and beyond" was how Detroit was being characterized around the Bears in Lake Forest. While the Bears (4-1) were enjoying a bye-week, the Lions (2-3) came back in the 4th quarter to beat the Philadelphia Eagles 26-23; they won despite racking up 16 penalties (playing through the whistle and beyond). That was a huge win for the Lions; much has been expected from them this year. They were a big story last season making the playoffs after being the NFL doormat for a long time. Of course, the Bears would love to beat them to maintain a good distance with their lead in the NFC North’s division. The only blemish on the Bears season was the loss to Green Bay — a loss to the Lions wouldn’t be devastating, but could complicate playoff scenarios. 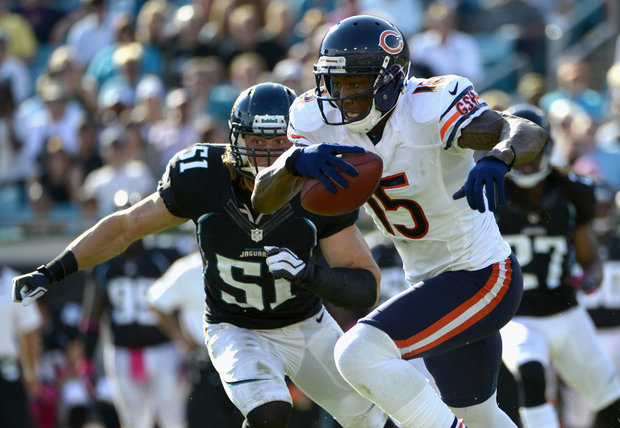 The Bears will not play any divisional opponents until they meet Minnesota in late November. Two very different head coaches Some say the team of wacky, energetic Detroit head coach Jim Schwartz is undisciplined; others say his players feed off him. Conversely, Lovie Smith has a calm and steadfast demeanor on the Bears sideline. His players respond well to his approach. One stat worth bringing up for Smith: He has a 8-2 record on Monday Night Football (no home losses). Both have young, aggressive quarterbacks, Matthew Stafford for Detroit and Jay Cutler for the Bears, who are complemented by huge wide receivers, Detroit&apos;s Calvin Johnson and Chicago&apos;s Brandon Marshall, who they each love to target. The Lions drafted their duo, while the Bears traded for their tandem. Marshall admitted he enjoys basking in the Monday Night Football spotlight. “I love some of the attention; when you have that spotlight on you have to show up and perform,” said Marshall. The Bears offensive line hopes to control the line of scrimmage against the likes of Ndamukong Suh and the rest of the Lions defensive line. The Bears want to get their ground game going with Matt Forte and Michael Bush. The real fun will be the Bears third-rated defense against the second best offense in the league. This is where the Bears hope they can keep Johnson from making the big plays against their secondary. Charles Tillman has already returned two interceptions for touchdowns this year. Tillman against Johnson will be one of the best matchups of the game. The Lions rushing game is below average. The wild card in this game may be Devin Hester. He may have a bigger role in the offense since Alshon Jeffrey is out with his hand injury. Offensive coordinator Mike Tice lamented after practice that he wants to get him more involved. Where Hester may make an impact is on special teams — a weakness for the Lions. Some players are expected to return to action: wide receiver Earl Bennett and tight end/half back Evan Rodriquez. Last year Bears cornerback D J Moore and Lions QB Matthew Stafford got into a scrum after the Lion QB’s interception. Moore was ejected from that game, he says there are no grudges. . . but we’ll see. You should keep track how often the MNF broadcast focuses on Jay Cutler and his "issues." This is the first time the Bears have hosted the Lions on Monday Night Football. All previous meetings were in Detroit. Spotlight, chippy play, two teams that hate each other. . . get the popcorn! This will be quite the show.